Image: tri-wheel of three Chiron to Aries Point transits 2018--2019: April 17, 2018, September 25, 2018, and February 18, 2019. 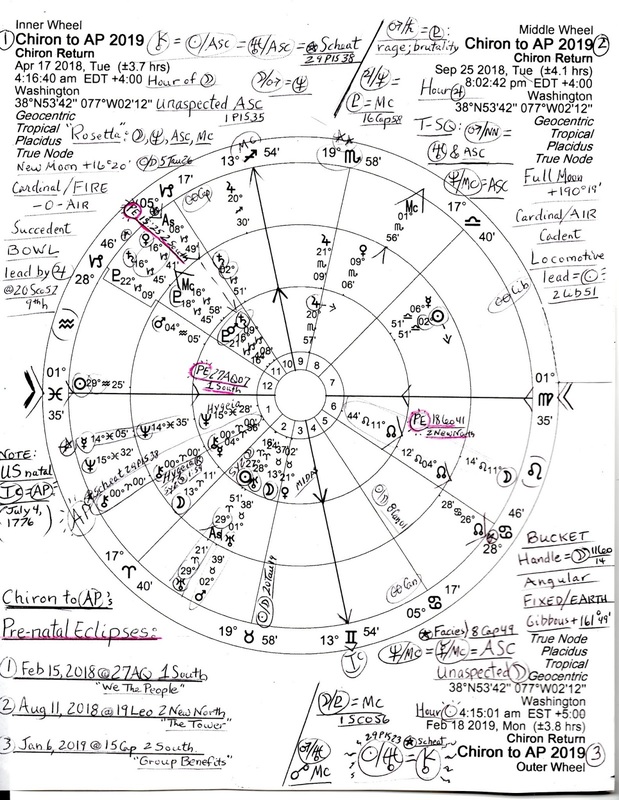 In a previous post titled Chiron to Aries Point 2018-2019, you'll find quite a few general details concerning centaur Chiron, the Wounded Healer and priest, plus, notes on Chiron in Mars-ruled Aries which happens to be America's natal placement of Chiron @20Ari08 in our national 4th house of Roots, Foundation, and Endings, July 4, 1776. 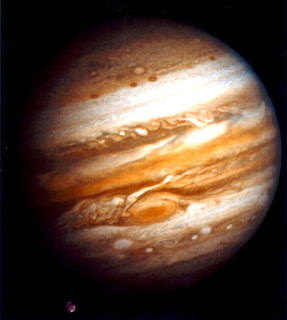 Rounding up, the Sabian Symbol for US Chiron @21Aries = "A Pugilist Entering The Ring" as we did in 1775/76 and beyond; and with US Chiron in Aries we often express the 'sacred warrior' archetype of the Seeker on a Quest identified as "pioneers, trailblazers, and/or mavericks" charting an independent course, seeking our national identity, and endeavoring to lead the world into the future (R. Nolle). As a nation we have traditionally held high the ideal that America fights for what is right, tarnished though that principled position has become with the less noble "might is right" attitude of expansionism, greed, and lust for ever-increasing power and military conquests. 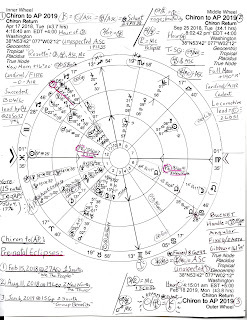 Yet America's 1776 chart contains a helpful Mars-Chiron sextile which Richard Nolle points out, "indicates one whose strongest energies are channeled into the social/aesthetic sphere as a crucible of the Quest for self-transcendence." 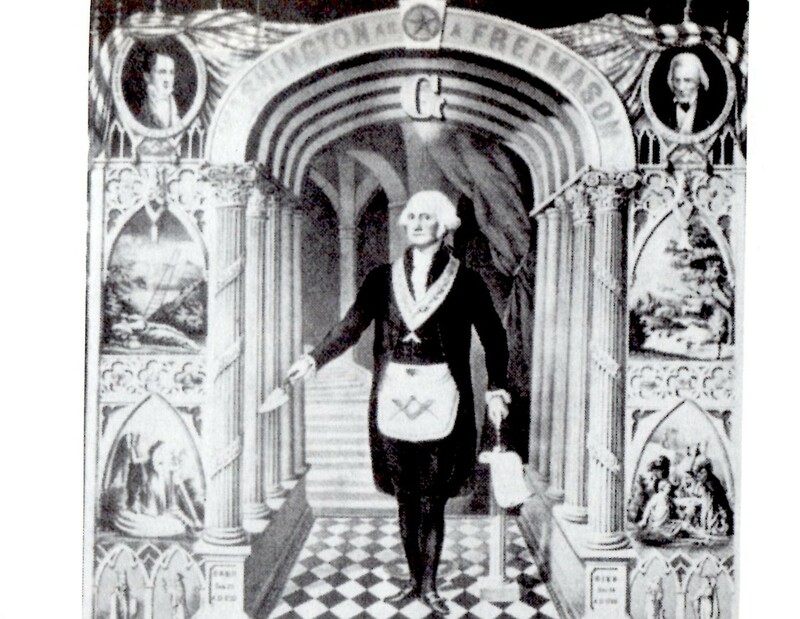 So as America's Chiron Return period of 2024/25 nears we may expect such principles to express within the Collective Mind once again in similar fashion to the events, personalities, and Quest of 1776 at the founding of our nation rising up as 'one among the many.' 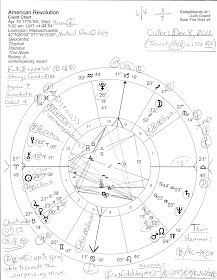 For after all, the 4th house is one of the Watery Psychological Houses (4/8/12--Cancer-Scorpio-Pisces) and relates to what is needed in order to feel that we are psychologically 'at home' with our inherent sense of identity, formerly wounded, but finally able to face our nation's inner pugilist and throw off the bonds of oppression. For more details see Richard Nolle's Chiron: The New Planet in Your Horoscope, the Key to Your Quest and The Sabian Symbols in Astrology by Dr. Marc Edmund Jones. If a modern version of the symbols is preferred I recommend Lynda Hill's excellent 360 Degrees of Wisdom. And did you happen to notice that The Great American Eclipse of August 21, 2017 @29Leo 'eclipsed' Chiron's natal Saturn @29Leo which is the same position of one of our Founding Fathers' natal Saturn?! In other words, the Discovery of Chiron basically timed a posthumous Saturn Return for...guess who?